Perched on a hilltop, facing the sun-bathed, whitewashed city of Mykonos, Mykonos View Hotel is a little paradise for the adults looking for a luxury stay. The hotel boasts its stunning architectural design that blends sculpted curves with pretty white exteriors, looks like a pretty fortress sitting proudly on the Mykonos island. The rooms and suites, built in traditional Cycladic architecture, roll down the slopes of the hill and offer outstanding sea views. The hotel features an impressive outdoor swimming pool with a bar that also comes with gorgeous views of the blue Aegean Sea and the pretty town. The on-site restaurant and a pool bar serve a variety of cuisines and drinks, or if you wish to explore the real Greek hospitality and culinary feasts, head to the nearby beaches and villages. Beach bums won’t be disappointed, as the nearest beach Agios Stefanos is around 2.5 km from the hotel. 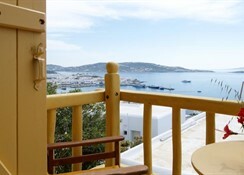 The stunning Mykonos View Hotel, situated on the slopes of a hill in Mykonos, is known for its lively nightlife, vibrant lifestyle and gorgeous beaches. The hotel is walkable distance from the main town of Mykonos and is surrounded by a few villages, meaning you can have the best of both worlds. Explore the lively restaurants and cafes in the main town, or the head to the harbour area and be a part of the vibrant nightlife. The hotel makes a fine base for exploring the wide array of superb beaches, smaller villages in the hills and all the many attractions of the Island. The nearest airport is Mykonos Airport, which is 3 km from the hotel. There are 30 rooms available, from double rooms and family rooms to superior rooms and maisonettes, catering to everyone’s taste and needs. 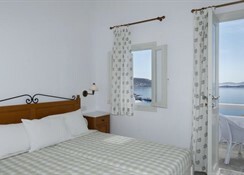 Each room offers stunning Mykonos sea views, privacy and class that you always imagined in your luxury hotel. The hotel rooms come equipped with mini refrigerators, air conditioning, satellite TV, safe box, direct dial telephones, free Wi-Fi, flat screen TV, en-suite, coffee maker, minibar and more. 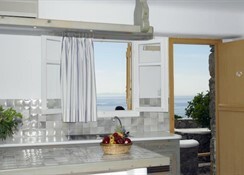 Some rooms have a fridge or kitchenette. The hotel boasts an excellent restaurant and a lively pool-side bar. An American breakfast buffet is served daily in the breakfast area. The modern Oniro bar offers food and drinks with a stunning view of the Aegean Sea. Other than that, there are restaurants and bars aplenty in the main town awaiting to be explored. With an outdoor swimming pool with sun beds, lounge bar, breakfast area that comes with loungers and pool bar, Mykonos Views is a perfect place to kick back and relax amidst the picturesque views. The pool’s wooden deck and its wooden edge resemble the gunwale of a boat and it becomes all the more spectacular when the pool is lit up at night. The pool bar, with stunning views and lively ambience, is an ideal spot to sip your favourite cocktail and enjoy the evening. 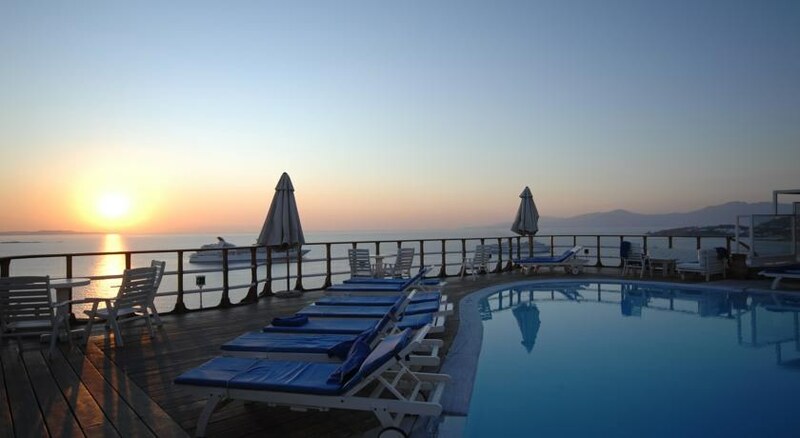 The hotel offers a quick access to the harbour area and its famous lively nightlife.